Royal Davui Island Resort in Fiji is an exclusive, adults-only resort and sanctuary situated in Fiji’s spectacular Beqa Lagoon. This luxury Fiji-Island resort features 16 exquisitely appointed vales (stand alone cottages or Bures) nestled around 10 acres of lush tropical landscape. 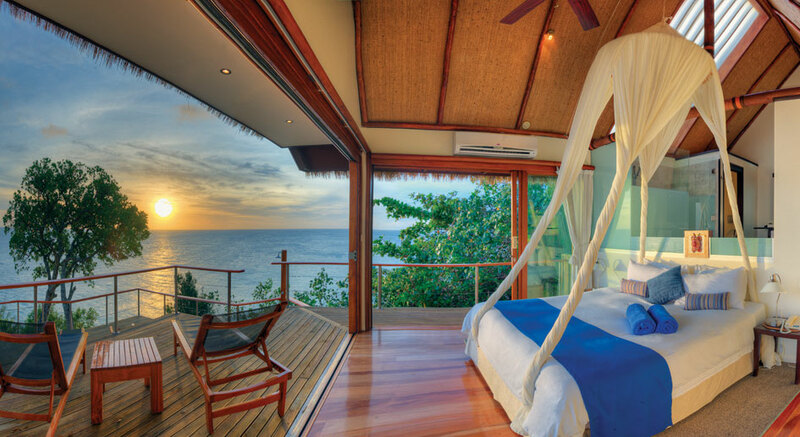 Ensuring the ultimate in privacy, personal service, and relaxation, this luxury Fiji resort allows no more than 32 guests on the island at any one time. Royal Davui’s 16 vales include two buildings connected with a covered foyer, and all offer maximum views while offering the utmost in privacy. Each Vale offers modern Pacific decor with thatched roof, open floor plans opening out onto a luxurious veranda overlooking the Bequ Lagoon. Each is also equipped with a private plunge pool, and includes twice daily maid service. There are four different categories available: Island Vale, Deluxe Vale, Premium Vale & the Royal Davui Suite. All meals and welcome refreshments are provided at no additional cost. Beverages are available for an additional cost. There are also various dining options in addition to the lovely dining room, such as dinner on the beach or in your vale… Flexibility is the name of the game here! Royal Davui offers the ultimate for those seeking to elope and be married in Fiji. They offer lovely wedding packages which are very limited, so advance booking is very important. Please ask about wedding details. Depending upon the time of year a free wedding may be possible. Most activities at Royal Davui are available at no extra charge. The snorkeling and diving in the area is fantastic. Private deep-sea-fishing charters and hand-line fishing are available; a guide can be arranged if necessary. Surfing can also be found for those with experience. There are many other activities, some for a nominal fee. Children under the age of 16 years of age are not permitted at Royal Davui Island Resort, unless the entire resort is booked by a private party. Royal Davui is an adults only resort otherwise.